Image: Bell (bo) with birds and dragons, from a set of four, China, Shanxi province, State of Jin, Houma foundry, Eastern Zhou dynasty, late Spring and Autumn period, ca. 500–450 BCE, Purchase—Charles Lang Freer Endowment, Freer Gallery of Art F1941.9; Two bells (bo) with felines and dragons, possibly from a set of four, North China, Eastern Zhou dynasty,late Spring and Autumn period, ca. 550–500 BCE, Gift of Arthur M. Sackler Arthur M. Sackler Gallery S1987.274, 307; Bell (bo) with felines and dragons, China, Shanxi province, State of Jin, Houma foundry, Eastern Zhou dynasty, late Spring and Autumn period, ca. 550–500 BCE, Gift of Arthur M. Sackler Arthur M. Sackler Gallery S1987.282. Musical innovations in the Bronze Age meld with today’s digital technology in this interactive exploration of ancient Chinese bells. 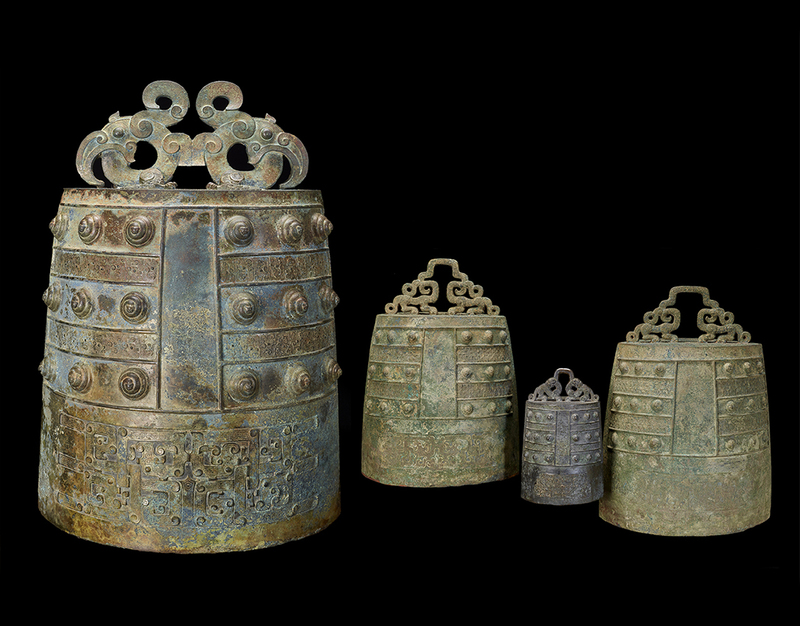 Thousands of years ago, Chinese musicians worked with foundry technicians to cast matched sets of bronze bells of different sizes to produce a range of tones. They developed oval-shaped bells that, depending on where they were struck, produced two distinct pitches with an intentional interval between them. Resound investigates this advancement with displays of early instruments including a graduated set of matched bells discovered together in a Chinese tomb, videos of ancient bells being played, and chances for visitors to compose their own music on virtual bronze bells.